The other day I was asked “How far will this Peregrine Falcon that is being released back to the wild migrate?” That’s a great question without a simple answer. Migration is complex as a bird needs to know where it is now, which direction it will go and where its destination is. Bird species use different navigation tools to migrate. There are species that use the sun, species that use landmarks like coastlines and rivers, species that migrate at night and use the stars, species that use olfactory cues and species that use the Earth’s Magnetic field which they monitor with tiny grains of magnetite in their heads that act as a compass. Peregrine Falcons are found all over the world and of the 19 different subspecies many have different migratory habits. The “tundrius” subspecies nest on the tundra and will move an astounding 15,500 miles each year to spend winters in South America. The “anatum” subspecies generally spends the winter on its breeding grounds, unless they nest in the far north. This subspecies was once common across the Eastern United States but was extirpated by DDT. 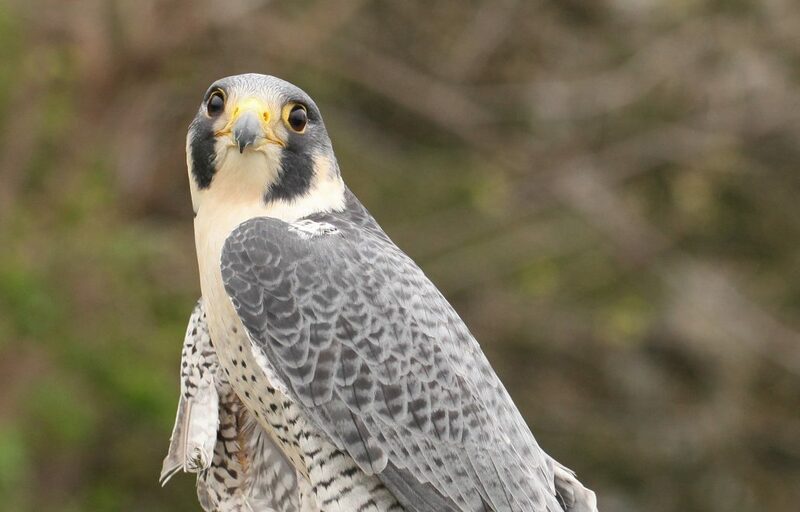 Through hard work and numerous partnerships, Peregrine Falcons have been restored in much of their eastern U.S. habitats. The young female Peregrine Falcon that was released looked like she was an ‘anatum’ subspecies. A logical guess would be that she’ll make some small seasonal movements and then try to set up a nest site in the Midwest in the next year or two. As she was banded with a federal band, plus a color marked alpha band, researchers may re-encounter her in the future and we’d all find out more about the life of this fascinating bird.